For the first time, Trump flirts with conspiracy theories about a top aide to Hillary Clinton. 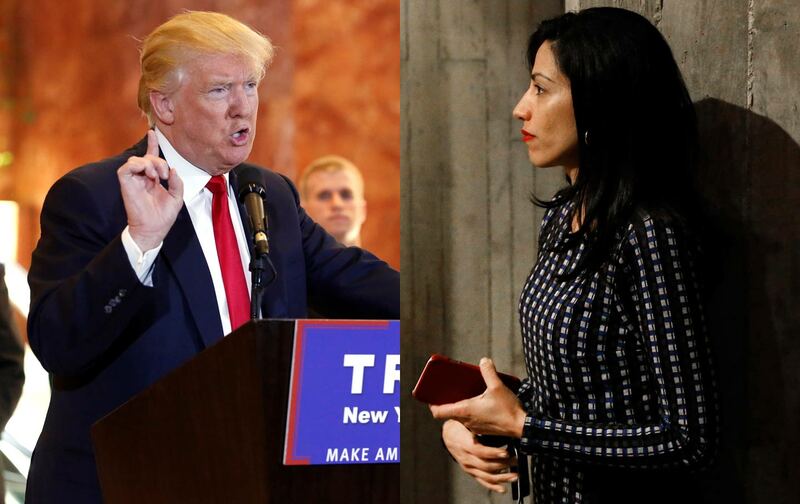 Donald Trump alluded for the first time on Monday to a theory that Huma Abedin, a top aide to Hillary Clinton, might have nefarious ties to radical Islam. That sounds like a strange aside, but Trump was giving voice to long-running right-wing theories that Abedin is connected to radical Islamic elements. Specifically, Trump is likely referring to the fact that Abedin was once listed as an assistant editor at the Journal of Muslim Minority Affairs, which is edited by her mother. The Abedins’ employment at JMMA was the subject of a recent New York Post article, which tarred the journal as a “radical Muslim” publication. The Trump campaign would not confirm nor deny that Trump was referring to the journal, but pushed back on The Nation’s characterization of Trump’s remarks as an “accusation” about Abedin. “There is nothing more to add but I would definitely not characterize that as an ‘accusation,’ it’s a statement or a suggestion,” said campaign spokeswoman Hope Hicks. That suggestion carries some heavy weight in the conservative media sphere, however. And this appears to be the first time Trump has publicly tried to tie Abedin to ostensibly radical Muslim elements, even if he took a backhanded approach. Former representative Michele Bachmann also recently told World Net Daily that Abedin’s work on the journal may ultimately help Clinton usher Sharia law into the United States. “Abedin, Saudi-based during her formative years, having grown up in the family business of advancing Islamic Shariah rule across the globe, may certainly use her position of influence to turn Hillary Clinton toward a decidedly pro-Shariah law view in the U.S.,” she said. Bachmann began attacking Abedin back in 2012 for supposed radical ties, earning her a rebuke from Senator John McCain. One of the most popular outlets for Abedin conspiracies has been Breitbart.com. Trump just hired Breitbart executive chairman Steve Bannon to help run his campaign; Bannon has used his radio show to peddle similar conspiracy theories about Abedin, as Mother Jones recently reported. Bannon was said to be planning a “gloves-off” approach to taking on Clinton, and Trump ally Roger Stone said in July that it’s “only a matter of time” until Trump attacked Clinton over Abedin’s supposed ties to the Muslim world, including raising the question of why Abedin has a security clearance. It appears that time has arrived.